Traveling from the forests and fields of Europe to the grasslands south of the Sahara desert is a monumental trip for anyone, and especially for a diminutive insect. Yet every year, populations of the painted lady (Vanessa cardui) butterfly make that journey over the course of several generations. The logistics of this migratory feat had been speculated for some time, but never fully understood, in part because of the difficulty of tracking the tiny insects across long distances. In a study published October 4 in Biology Letters, researchers reported having measured the isotopic composition of butterfly wings in Europe and south of the Sahara. 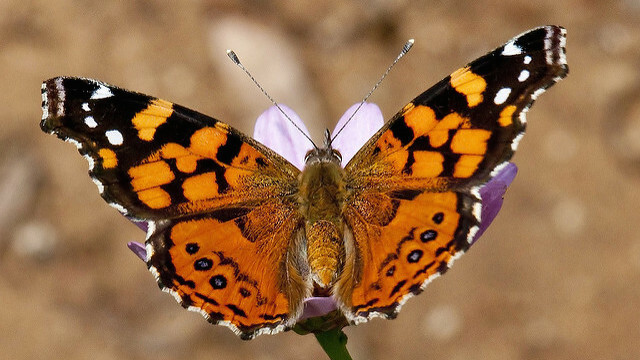 Since the fraction of heavy hydrogen isotopes in the environment varies geographically, the team used its analysis to identify the origins of butterflies captured, confirming that groups of butterflies in the Sahara did originate in Europe. The butterflies do not linger in Africa long. They most likely make their trip, the authors suggested, to take advantage of the burst of productivity in the tropical savannah that follows the rainy season—and to breed the generation that will start the trip back. 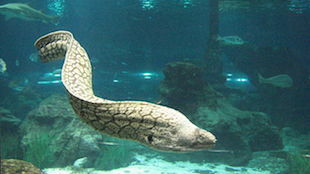 Europe’s freshwater eels (Anguilla anguilla) live out their days in rivers and streams, but they never spawn there. Massive catches of larval eels in the Sargasso Sea tipped researchers off a century ago that eels must spawn in the swirling mid-Atlantic gyre of free-floating seaweed and then migrate to Europe. Eels leave their homes in the late fall, but other than that, the details of their journey have been a mystery. In the most extensive tracking study to date, researchers attached satellite tags to eels and monitored the animals’ progress as they lit out for open seas, presumably to arrive in time for the breeding period (winter to early spring). But the 80 or so eels for which the team reconstructed migration routes were moving in meandering patterns and at far too slow a pace to reach the breeding ground in time. In another migratory surprise, the common swift has butterflies and eels beat for sheer endurance. The birds spend two months a year building nests and hatching young, but for the rest of the year they are on the move. Researchers recently found that some stay airborne for the entire 10 months that they are away. 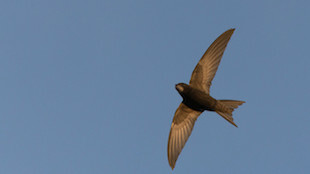 A group at Lund University attached microsensors to a group of swifts, finding that the birds all spent more than 99 percent of their non-breeding months airborne. “They feed in the air, they mate in the air, they get nest material in the air,” coauthor Susanne Åkesson told National Geographic. The team’s findings were published October 27 in Current Biology. 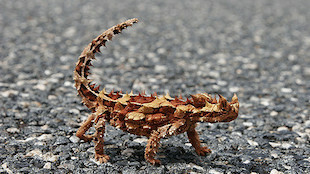 Thorny devils are fearsome-looking desert lizards fittingly named Moloch horridus, which subsist on a diet of ants scavenged from sand. Their mouths have evolved to become so specialized for this purpose that the lizards are unable to lap up water like most lizards, a serious problem in the parched desert. In a study published November 2 in the Journal of Experimental Biology, biologists demonstrated that thorny devils overcome their water problem by drinking with their skin. Microscopic capillary channels on their spiked mantle lift water from a puddle or even from damp sand and funnel it straight into the lizard’s mouth. The phenomenon had been previously observed, but in this latest study, the researchers measured how much and how quickly the lizards can drink, concluding that they cannot subsist on morning dew alone, as had been hypothesized. Instead, the thorny devil’s habit of shoveling damp sand onto its back probably plays a role in keeping the creature hydrated, the researchers wrote. The world’s oceans have become a repository for vast amounts of trash that wash out of cities and towns. 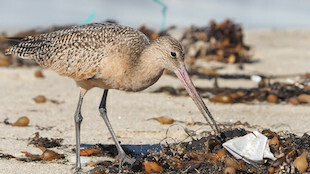 Marine animals, particularly sea birds, frequently mistake that trash for food. Numerous explanations as to why a bird would choose to choke down a plastic fork have been proposed, but researchers now believe the answer may be that plastic smells like food to a bird. A staple in the sea bird diet are krill, which in turn feed on algae, which themselves emit a distinctive odor. Over the course of refining their foraging tactics, sea birds learned to follow that odor to feast on krill. However, researchers have now found that small bits of plastic floating in the ocean are often swarming with algae, emitting a strong, krill-like odor as a result. In a Science Advances paper, the group wrote that plastics act like an “olfactory trap,” ringing a dinner bell for birds and enticing them to dine on trash.